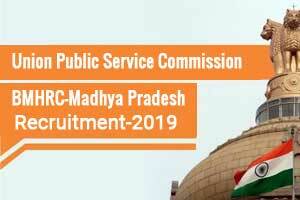 New Delhi: The Union Public Service Commission (UPSC) has issued a notification where it invited applications for 354 vacancies at Bhopal Memorial Hospital & Research Centre (BMHRC) Bhopal, Madhya Pradesh, Department of Health Research, Ministry of Health & Family Welfare. The recruitment will take place for the posts of Medical Officer (GDMO), Assistant Professor, Senior Lecturer on Regular Basis. The selection for the said posts will take place through Interview. The vacancies are in the Department of Medical Officer (General Duty Medical Officer), Anaesthesia, Cardiology, CTVS, Gastro Medicine, Gastro Surgery, Nephrology, Neurology, Psychiatry, Pulmonary Medicine, Surgical Oncology, Radiology, Urology, Anaesthesiology, Forensic Medicine, General Medicine, Paediatric, Tuberculosis & Respiratory Diseases, Pathology, Radio Diagnosis. CLOSING DATE FOR SUBMISSION OF ONLINE RECRUITMENT APPLICATION (ORA) THROUGH ORA WEBSITE IS 23:59 HRS ON 31.01.2019. THE LAST DATE FOR PRINTING OF COMPLETELY SUBMITTED ONLINE APPLICATION IS UPTO 23:59 HRS ON 01.02.2019. DATE FOR DETERMINING THE ELIGIBILITY OF ALL CANDIDATES IN EVERY RESPECT SHALL BE THE PRESCRIBED CLOSING DATE FOR SUBMISISON OF ONLINE RECRUITMENT APPLICATION (ORA). THE APPLICANTS ARE ADVISED TO FILL IN ALL THEIR PARTICULARS IN THE ONLINE RECRUITMENT APPLICATION CAREFULLY AS SUBMISSION OF WRONG INFORMATION MAY LEAD TO REJECTION THROUGH COMPUTER BASED SHORTLISTING APART FROM DEBARMENT BY THE COMMISSION. DATE FOR THE INTERVIEW ON WHICH THE SHORTLISTED CANDIDATE IS REQUIRED TO BRING THE PRINTOUT OF HIS/HER ONLINE APPLICATION ALONGWITH OTHER DOCUMENTS AT UPSC SHALL BE INTIMATED SEPARATELY. As per under Govt. rules. Application Fee: Candidates are required to pay a fee of Rs. 25/- (Rupees Twenty five) only either by remitting the money in any branch of the SBI by cash or by using net banking facility of the SBI or by using visa/master credit/debit card. i) Candidates must apply online through the website http://www.upsconline.nic.in. Applications received through any other mode would not be accepted and summarily rejected. a) Matriculation/10th Standard or equivalent certificate indicating date of birth, or mark sheet of Matriculation/10th Standard or equivalent issued by Central/State Board indicating Date of Birth in support of claim of age. Where date of birth is not available in certificate/mark sheets, issued by concerned Educational Boards, School leaving certificate indicating Date of Birth (in case of Tamil Nadu& Kerala). b) Degree/Diploma certificate as proof of educational qualification claimed. In the absence of Degree/Diploma certificate, provisional certificate along with mark sheets pertaining to all the academic years. c) Order/ letter in respect of equivalent Educational Qualifications claimed, indicating the Authority (with number and date) under which it has been so treated, in respect of equivalent clause in Essential Qualifications, if a candidate is claiming a particular qualification as equivalent qualification as per the requirement of advertisement. d) Certificate(s) in the prescribed proforma from the Head(s) of Organization(s)/Department(s) for the entire experience claimed, clearly mentioning the duration of employment (date, month & year) indicating the basic pay and consolidated pay. The certificate(s) should also mention the nature of duties performed/experience obtained in the post(s) with duration(s). Experience Certificate should be issued in prescribed format relevant to the post. Experience certificate not in prescribed proforma but containing all the details as mentioned above would be considered on merits by the Commission. e) Caste certificate by candidate seeking reservation as SC/ ST/ OBC, in the prescribed proforma from the competent authority indicating clearly the candidate’s Caste, the Act/ Order under which the Caste is recognized as SC/ ST/ OBC and the village/ town the candidate is ordinarily a resident of. f) A declaration in the prescribed format by candidate seeking reservation as OBC, that he/she does not belong to the creamy layer on the crucial date, in addition to the community certificate (OBC). Unless specified otherwise, the prescribed closing date for receipt of Online Recruitment Application for the post is to be treated as crucial date. g) Physically Handicapped certificate in prescribed proforma issued by the competent authority by Physically Handicapped persons eligible for appointment to the post on the basis of prescribed standards of Medical Fitness. The Competent Authority to issue Physically Handicapped certificate shall be a Medical Board duly constituted by the Central or a State Government. The Central/ State Government may constitute Medical Board(s) consisting of at least three members out of which at least one shall be a specialist in the particular field for assessing Locomotor/ Cerebral / Visual / Hearing disability, as the case may be. h) Documentary support for any other claim(s) made. Note: If any document/ certificate furnished is in a language other than Hindi or English, a transcript of the same duly attested by a Gazetted officer or notary is to be uploaded. iii) IMPORTANT : CANDIDATES ARE ADVISED TO FILL THEIR CORRECT AND ACTIVE E-MAIL ADDRESSES IN THE ONLINE APPLICATION AS ALL CORRESPONDENCE WILL BE MADE BY THE COMMSSION THROUGH E-MAIL ONLY. INTERVIEW SCHEDULE AND REQUIREMENTS WITH REGARD TO COPIES OF CERTIFCATES TO BE SUBMITTED IN RESPECT OF CLAIMS MADE IN THE ONLINE APPLICATION WILL BE E-MAILED IN DUE COURSE TO THE CANDIDATES IN THEIR REGISTERED E-MAIL ID AND WILL ALSO BE POSTED ON THE WEBSITE OF THE COMMISSION. iv) Candidates who wish to apply for more than one post should apply separately for each post and pay the fee for each post in the prescribed manner. v) After submitting the Online Recruitment Application (ORA), the candidates are required to take out a print out of the finally submitted Online Recruitment Application. vi) Candidates are not required to submit to the Commission either by post or by hand the printouts of their online applications or any other document. They will be required to bring along with them the printouts of their online applications and the documents mentioned in para 7 below if called for interview. vii) The applicants are advised to submit only single Online Recruitment Application for each post; however, if somehow, if he/she submits multiple Online Recruitment Applications for one post, then he/she must ensure that Online Recruitment Application with the higher “Application Number” is complete in all respects including fee. The applicants, who submit multiple Online Recruitment Applications, should note that only the Online Recruitment Application with higher “Application Number” shall be entertained by the Commission and fee paid against one “Application Number” shall not be adjusted against any other “Application Number”. viii) The candidates are advised to submit the Online Recruitment Application well in advance without waiting for the closing date. For more details click on the original website given below.